The Cotswold Oak Range is an extensive collection of quality oak furniture pieces ideal for rooms all across the home – any home: from apartments to starter homes to family residences. The Cotswold Oak Range boasts high quality solid oak frames and oak veneer panels with a sumptuous light oak finish that blends seamlessly with all interior designs. Cotswold Oak pieces feature a lacquered finish, giving the collection a rich, warm glow and an appealing rustic edge. Clean design lines and smooth edging give the Cotswold Oak Range an impressive and versatile look. Dovetail joints provide sturdiness and a fine attention to detailing, such as antique-style handles add the finishing touches. 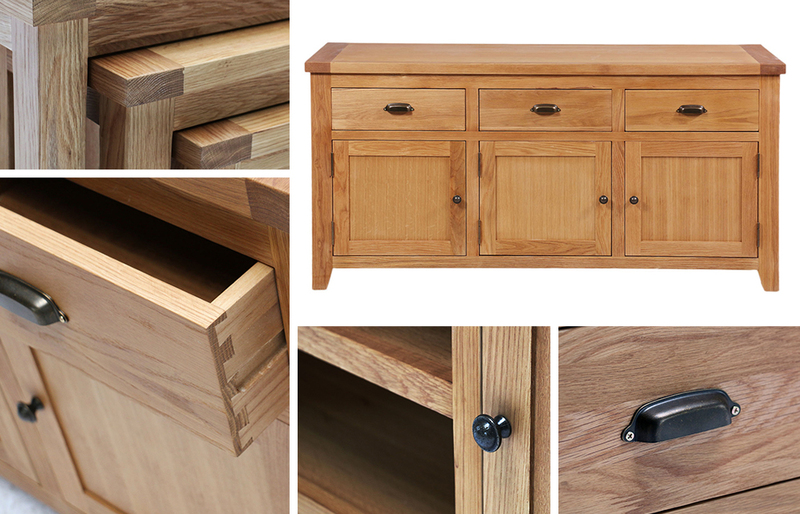 With nearly 30 pieces to choose from, The Cotswold Oak Range has a piece fit for all rooms in the home. The practicality and adaptability of the collection ensures that many of its pieces could serve several purposes in different rooms around the home, according to your needs. The range of Cotswold Oak dining tables come in various sizes, meaning that you can choose a piece that would be perfect for a busy dining kitchen or a dining table that would be an eye-catching centrepiece in a dining room. An extensive range of oak cupboards, sideboards and bookcases would look equally impressive in the dining room, living room or hallway. For rooms all across the home, you can choose several Cotswold pieces to create a highly attractive coordinated look. Equally, the beautiful tones of Cotswold Oak will work superbly as standalone pieces that will elevate any space. With practicality, versatility and most of all, style in abundance, the Cotswold Oak Range really does have it all.